One of the reasons countries support indigenous defence industries is to ensure their sovereign control over defence capabilities. The argument  is that by having the ability to design, manufacture and sustain military equipment, a country won’t be reliant on others in times of crisis. The problem for small and medium-sized powers (and increasingly even major ones) is that modern military systems are so complex that it’s beyond the ability of their economies to design and build them (though countries like Australia are capable of sustaining them). So even small countries with highly developed defence industries, such as Israel , buy complex platforms on the global market and focus their own efforts on specific, high-value systems that they can’t source from elsewhere. This makes sense provided the sovereign risks can be managed. In recent history, Australia has acquired advanced military platforms from the United States, which is a pretty safe bet because there’s a relatively low probability that the US will cut off supplies. But when the number of players in a program multiplies, so do the risks, particularly at a time when longstanding alliances appear to be unravelling. The F-35 joint strike fighter (JSF) program, which is a consortium of nine countries, is a useful case study. Turkey has been a member of the consortium from the beginning and is planning on acquiring around 100 aircraft, potentially making it the third biggest operator globally. As part of its membership, Turkey also receives opportunities for industrial participation and 10 Turkish companies  have been involved in development and/or production of the jet. Consequently, the meltdown in relations  between Turkey and the US presents a number of risks to other consortium members, including Australia. There are number of reasons for the precipitous decline. 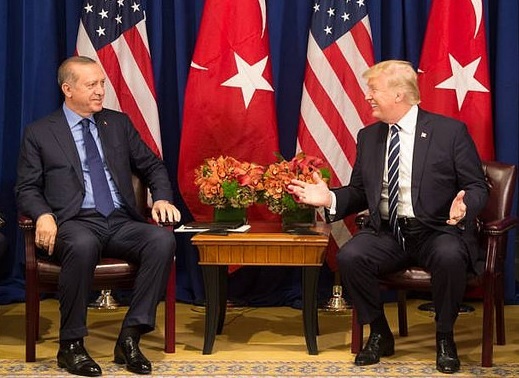 In part, it’s due to US President Donald Trump’s personal sense of betrayal  that Turkish President Recep Tayyip Erdoğan reneged on a ‘deal’ to release an American pastor imprisoned in Turkey. It’s also related to Turkey’s overall slide from democracy to strongman authoritarianism, as well as Turkey’s military action against Syrian Kurds who are supported by the US. But another reason is that the US Congress is concerned about Turkey’s plans to buy Russia’s S-400 long-range air-defence system—a remarkable thing for a NATO member to do, considering it can’t be integrated into NATO air-defence networks. It’s a sign of the parlous state of relations between Turkey and its Western allies. As part of the US defence funding bill just signed by Trump, Congress blocked exports  (section 1283) of JSFs to Turkey while the Pentagon assesses the impact of Turkey’s acquisition. The Royal Australian Air Force on a very tight timeline to achieve initial operating capability  (pages 121–134) with 33 aircraft in just over two years’ time, so any interruption to aircraft deliveries could affect the schedule. The second risk may not affect Australia directly, but it illustrates the challenges presented by a consortium approach. The JSF joint program office assigns participants responsibility for various maintenance and repair activities. Turkey was assigned responsibility for engine deep maintenance in Europe (to be supplemented later by Norway and the Netherlands). At the time, some in the UK raised concerns  about the sovereign risk this presented. If Turkey is barred from or leaves the program, European consortium members will need a Plan B. While there’s probably enough time for them to develop an alternative, it highlights the extent to which participants are dependent on other consortium members to support a key military capability. The third risk does have serious implications for Australia should Turkey receive aircraft while also realising its plans to acquire the S-400. The JSF was designed to defeat high-end Russian air-defence systems such as the S-400. Russia will be very anxious to understand the JSF’s electromagnetic signatures, in particular its radar profile. And as Serbia’s shooting down of a previous generation US stealth aircraft in 1999 using antiquated Soviet air-defence technology showed, tactics can be as important as technology . The Russian technicians who will be assisting the Turks to introduce and operate the S-400 will no doubt be collecting JSF signature data that can be used to develop tactics to defeat it. In a ‘normal’ world one would expect the flow of information to go in the other direction, with Turkey sharing key signature and performance data on the S-400 with other NATO members. But when a NATO member is planning to acquire Russian air-defence systems, we’re not in a normal world anymore—not to mention Erdoğan’s threats  to find new and different allies. While it’s unlikely that Australian F-35s will be flying against Russian S-400s anytime soon, Russia is exporting S-400 systems, including to China . And offering JSF signature data to any country that might have an interest in defeating the JSF could potentially be a nice earner for a cash-strapped Russia. So the tangled web of US–Turkish relations does have implications for Australia. With the first Turkish F-35 not scheduled to come home until late next year, there’s potentially time to find a solution. But as this example shows, in a world of inter-meshed supply chains, membership of a global network of operators is a double-edged sword. Marcus Hellyer is APSI’s senior analyst for defence economics and capability. Edited image courtesy of the White House on Flickr.